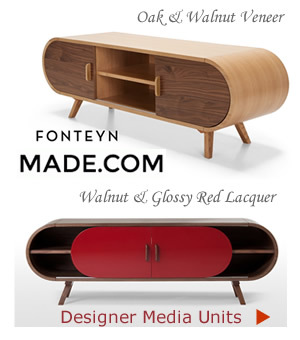 The collection of media units at Made.com are distinguished by their aesthetics and elegance. Recognised for producing low priced designer furniture makes their range all the more pleasing. It’s here you’ll also discover functional and practical pieces to house a TV and hi-fi equipment along with matching items to set off a room. Best of all buying direct from the makers allows huge discounts to be passed on to the customer. Enjoy the striking creation from Steuart Padwick, just one of the award winning furniture designers found at Made.com. His popular designs include the eye-catching Fontyne collection in a choice of finishes. In the sophisticated corner there’s the thick oak and walnut veneer cabinet and for an edgier look a walnut and glossy red lacquered unit. The contrasting light wood beautifully offsets each other bringing elegance to any room. In addition to gracefully rounded edges and clean lines is an expertly crafted piece made to last. 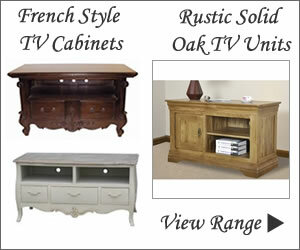 A strong and sturdy TV stand sits on solid oak legs that gently flare out for a hint of retro. Perfectly made with practical storage space hidden behind cool looking sliding doors. The Fonteyn is a great retro addition for the home with bold curves, angled legs and a great colour combo keeping the look ultra modern. Slide together for a trendy colour block look or position at either end of the unit to display the shelves in the middle. 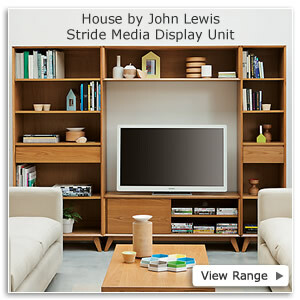 Either way this space saving cabinet will serve you well keeping all your media gadgets and DVDs neatly out of the way. Have fun with the fabulous Fonteyn collection and make a style statement throughout the house. The uniquely shaped collection includes a console table that can easily double as an occasional desk. Also in the range are coffee, dressing and bedside tables, smooth wooden stools and beds. Fresh designs in sideboards and dressers work in the living room as well as the dining area and are perfect for housing today”s super slim TVs.